See how the API will bring efficiency to your risk management program. Increase productivity and risk transparency with the RapidRatings Risk Management API suite. The new API suite enables the integration of the FHR® with leading GRC and e-Procurement platforms, Corporate Social Responsibility (CSR) and SCRM tools, and in-house systems to automate workflows and run increasingly complex risk management scenarios. Current API integrations that are live include Hiperos Opus, Markit KY3P, ProcessUnity, Rsam, and various in-house systems. Existing risk management programs often have leading platforms or internally built systems to view risk. Increase efficiency by combining financial health data with existing workflows within these platforms or systems for a holistic view of risk. Learn more about pre-built integrations with existing partner technologies and view our full list of partners here. Many clients have financial health data for their counterparties and need an efficient way to process the data into Financial Health Ratings. Automate the traditional data entry and data extraction processes to support a new level of ratings insight. 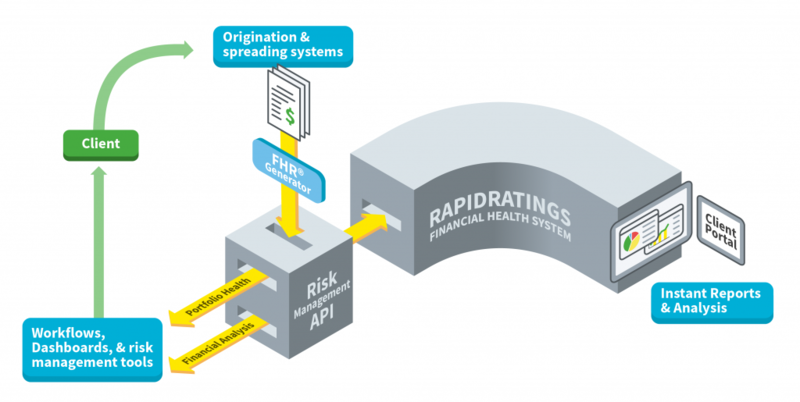 The RapidRatings API helps to scale credit and investment risk management processes by developing advanced financial analysis capabilities. Get a complete picture of the financial health of your entire supply chain or credit risk portfolio. Access current and historic FHR scores and other key financial performance indicators for public and private counterparties. Leverage RapidRatings’ repository of financial statements for your public and private counterparties to build custom risk analysis processes and solutions into risk management workflows. Access the underlying, historic financial data (balance sheet, income statement and cashflow statement) for private counterparties and public companies. Instantly generate FHRs and other key performance indicators for your counterparties. Companies that have access to counterparties’ financial data can integrate directly into internal origination or spreading platforms to automate the distribution of this data in the Financial Health System.